heartofdakota.com • View topic - Let's share our schedules! Re: Let's share our schedules! Hi! I just thought I'd share our schedule for the 2012-2013 year. We're using Beyond and Bigger and loving it. I'll post this thread on Rev2Rev times from my3sons in the hopes it will help those of you planning for Rev2Rev. Reading about History: 25 min. *Note: This may be longer on the written narration day, though this will balance out as there is no history project on the written narration day. *Note: One day will be shorter when there is no state study. Bible Quiet Time: 15 min. *Note: Add 15 min. more if doing "Discovering Mathematics". I only have certain times for starting school and naptime. Others are just the routine for our day. We do make a point that if we are "behind", we stop where ever we are to do lunch in time to have littles down for nap by 1:15. Then start back up where we left off. Wow! Thank you ALL for sharing your amazing schedules! I actually despise rigid schedules (because I always feel like a failure), but after prayer and reading some wonderful homeschool books, I've learned to use schedules as a way to start a "habit"!!!! It works in our family. The first few weeks are stressful looking to follow a time frame, but after that, we just know what needs to be done when -- sort of like eating a meal. Thank you ALL again for giving me a place to start. Last edited by WhisperedAbundance on Mon Aug 26, 2013 12:44 pm, edited 4 times in total. Matthew 12:34 ..."For out of the abundance of the heart, the mouth speaks." Thanks for sharing your schedule, WhisperedAbundance! It looks so organized, balanced, and cheerful. 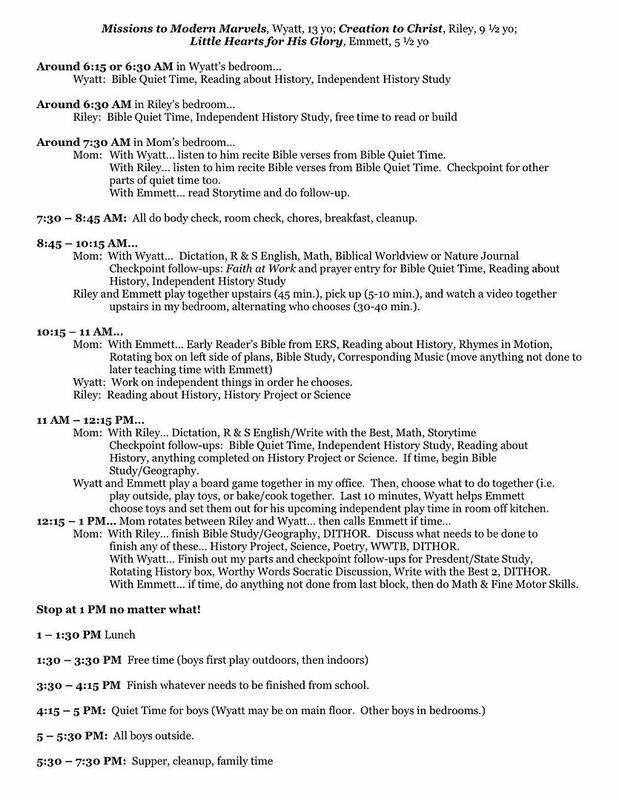 I know it takes time to share schedules, but it really can help others visualize their homeschooling days - so thanks!!! I love reading what everyone writes...so encouraging. Every family so unique. I am one who would love to be ultra organized and scheduled, but I have learned to be ultra flexible...and so have my children. My children have learned to get up and start with there music practice (violin, harp, piano) until breakfast, then help clean up breakfast and go for the subjects that they can work on independently until Mom is able to sit down with them and do the subjects they need help in. They are learning to take initiative in their work and even help eachother out when possible (which I found reinforces their learning and builds teamwork). We work around Daddy, who comes in for breakfast usually and we do family devotions together before we start homeschool lessons. There have even been times (two to be exact) when the girls and I have had our history and science reading cuddled in bed together in the evening...they now request it...they got up only to narrate...what fun memories! We have thoroughly enjoyed HOD! Learning is a lifestyle! I love the boxes that helps me keep organized and not overwhelmed, being able to place the subject box at the right time of the day around our music/sport/church/speech and debate/extra activities. God turned my barrenness to a jungle of joy! MomsMissionField wrote: I love reading what everyone writes...so encouraging. Every family so unique. I am one who would love to be ultra organized and scheduled, but I have learned to be ultra flexible...and so have my children. My children have learned to get up and start with there music practice (violin, harp, piano) until breakfast, then help clean up breakfast and go for the subjects that they can work on independently until Mom is able to sit down with them and do the subjects they need help in. They are learning to take initiative in their work and even help eachother out when possible (which I found reinforces their learning and builds teamwork). We work around Daddy, who comes in for breakfast usually and we do family devotions together before we start homeschool lessons. There have even been times (two to be exact) when the girls and I have had our history and science reading cuddled in bed together in the evening...they now request it...they got up only to narrate...what fun memories! We have thoroughly enjoyed HOD! Learning is a lifestyle! I love the boxes that helps me keep organized and not overwhelmed, being able to place the subject box at the right time of the day around our music/sport/church/speech and debate/extra activities. Thanks for sharing here, MomsMissionField! I enjoyed reading your perspective here, and I know this will resonate with some moms too. I loved picturing you and your dc cuddled up and reading together in bed at night - such precious memories to tuck away and hide in your heart. The boxes are such a help to me too - so true! Especially as the dc get older and start using the guides like student planners, checking of their boxes as they finish them - so helpful. I just had to share your signature brought tears to my eyes. God is truly the God of possibilities! I am praising God with you today and so glad your dc have you for their mama! Thank you for the info. How much time should each Missions to Modern Marvels box take? My soon to be11th grader is a dawdler. healthybynature wrote: Thank you for the info. How much time should each Missions to Modern Marvels box take? My soon to be11th grader is a dawdler. Reading about History: 30 min. Rotating History box: 20 min. ; Worthy Words day longer: around 40 min. Days 1, 2, and 4 President Study: 20-25 min. and Day 3 State Study: 35 min. Independent History Study: 15-20 min. Bible Quiet Time: 30-35 min. Who Am I? on 2 days: 20 min. and Nature Journal on 2 days: 20-30 min. Days 1-3 Science: 20-30 min. ; Day 4 lab longer like 45 min. R & S English, daily, 20-25 min. DITHOR, 3 days, 35 min. WWTB, 2 days, 20 min. Dictation, 3 days, 5 min. Well, this is still a work in progress and especially with my 3YO and 1YO we are adjusting to it, and adjusting it to our needs. But having the detailed schedule worked out really helps me at least have an idea of where to go and how to get there! The younger two were basically having unstructured time and were either massive interruptions or my 3YO would wander off and get herself into all kinds of trouble! Neither of these things are discipling both of them in what I want them to know. We've done this for 2 days so far and the first day was great, I woke the kids up right before 8, it went really smoothly. Today, my 1YO had been up for 2 hours in the night so I let him sleep in, let the other kids sleep in so I could prep my day, and it was really rocky. Bad attitudes, interruptions, fussy toddler. Argh. Well, I think we will get there, with a lot of help from the Lord! I also have two other tweaked versions of this schedule for days we have tennis lessons or swimming lessons this summer. Tennis is from 9-10 AM and Swimming is from 10:45-11:30. We try to get some things done before we go, I either don't do LHTH or I will do it with my 3YO while her older sisters are at tennis, we will do it outside, what fun, huh? I am excited to do my part of LHTH after my 1YO is down for his nap and before I put the 3YO in her room to rest. Sweet one-on-one time with her, she is kind of lost in the middle sometimes. My oldest seems to like reading the Bible story to my 3YO for LHTH. It's pretty easy reading for her! ETA: the thing that has surprised me most about making this schedule is that my 8YO wanted her own copy and likes looking at it to see what she's supposed to be doing. Both days there was a moment where she was supposed to be working with me but I wasn't quite ready to work with her yet but I gave her something else to do while she was waiting (play with brother, or something) and she did fine. It amazed me with maturity to read the schedule and get it. Last edited by MelInKansas on Wed May 29, 2013 4:26 pm, edited 1 time in total. His mercies never come to an end"
9:30-9:45 Chores: Take out garbages, put away silverware, wipe baby's tray, dust bust kitchen rug/floor. 12:50-1:15 Lunch (Sing hymn prior to eating and mom reads aloud Storytime box at lunch) Chores: Clear table after lunch. I thought it really interesting that you added in Greek, Art Appreciation, Color the Classics and a Nature Journal - all very CM and yet not scheduled or even suggested in Bigger. Did you only do it that one time with Shaw or have you done it with the other boys as well? Just last November 2010 you posted a full speed Beyond schedule (morphing into half-speed Bigger) with Greyson, but none of the additional things were in that schedule - did you feel they were unnecessary or took too much time or were you just not able to keep up with them? Someplace else... I don't know where I found it... you posted your Bigger "stride" times, and again the extras were not mentioned. I'm trying to work out my schedule now for Bigger and I would love to add in those same things (well, maybe Spanish instead of Greek, but you know what I mean! ) SO - I'm curious if you used a particular curriculum for Art Appreciation and why you chose Greek? Thanks for answering my nosy - I mean curious, questions! I am just seeing these questions now, so I'll pop-in and answer. Before we had our upper guides written, and when I only had two kiddos who were school-age, my schedule (and my time were a bit different than they are now)! Back then, we did do each of those areas I listed once each week. Prior to writing our guides, I also did poetry once weekly, but once the guides were written (and we included poetry in every guide) that was no longer necessary. You'll notice Bigger includes a pretty full poetry study (skill-wise) and each of the guides that follow Bigger include poetry in a unique way as well. Hymn study is another CM area that is included in both Bigger and MTMM - with the history of the writing of the hymn, sheet music, a corresponding devotional, and a fully orchestrated CD with which to sing along. Over time, I did discover that some drawing lessons were very helpful prior to our kiddos diving into a nature journal. So, to compensate for that we schedule Draw and Write Through History in multiple guides in row from Preparing Hearts on up to prepare kiddos in that area. We also discovered some work with watercolor painting was also very helpful prior to doing much nature journaling, so we added that into CTC every week to give kiddos experience in that area. Then, we scheduled nature journaling all year in MTMM, once kiddos have the experience of drawing over multiple years and painting in CTC under their belts. While I loved the idea of classical music, and it is wonderful to have the kiddos listen and enjoy music, we realized that a more formal study of classical music was appreciated more as the kiddos got older. So, we scheduled a year-long study of classical music in Rev2Rev. We also scheduled a formal picture study time throughout the year in RTR, as it matched so well with the study of the renaissance time period. So, as you can see we eventually took all of those strands of a CM style education and wove them within the fabric of our guides at a time that we felt kiddos could really absorb and enjoy those skills most. In the essence of being time conscious, we did not do all of those areas every year. You'll notice through HOD that what we try with our own kiddos often becomes a part of our guides, after years of pondering where these types of skills and studies seem to fit best. If you desire to add any of these things earlier, you can of course do that in a very low key way. Just be sure that you're not dropping other needed skills from the HOD guide to make room for the extras.